Too often content promotion gets overlooked by marketers, but it is as essential as the content creation itself. If promotion is key, then what outlets should you be using to advertise your content? You want to get it in front of as many people as possible, but you also want to be sure that you are targeting the right audience. There are three basic strategies that can be leveraged to promote new content – Owned, Paid and Earned Media. Your owned media assets are the easiest to leverage for content promotion, and should form the first rank of your content promotion strategy. When you create a piece of content (whether it’s an article, infographic, or white paper), it’s first obvious destination is your website or blog. But, it’s important to cross promote that content through your other owned assets. You have built (hopefully) a growing list of email subscribers. Now is the time to put that information to good use. Send out a bulk email, with a link, showcasing your new content. Leverage your social media accounts (Facebook, Twitter, etc) to advertise your content and drive traffic to your website or blog. If pitched right, your social media posts have the potential to get shared by your followers, thereby extending the promotional reach of your content. Use HootSuite to schedule out a Twitter campaign for 30 days or so and watch your follower base increase. Here are some other tools to help with your social campaigns and will make your life easier as well. There are some pitfalls with this option to be aware of. First, it takes a LONG time to scale owned media. And Second, it needs heavy social proof to be trusted content. However, don’t give up contributing to your own assets. Make sure each piece of content is stellar and take the time to research your topic on sites like BuzzSumo, then crush your competitors with insane detail and helpful tips and links. There are 2 million blog posts published each day! You have to take the time to create engaging content. And last but not least, make sure you take the time to craft your headlines, find or create great images (using alt tags), add good meta title and descriptions, and optimize all other on-page factors for the best online visibility. Paid advertising for content may seem counter intuitive. After all, isn’t the content we create is supposed to be the hook that drives the traffic? Nothing markets itself, and content is no different. Paid media is where you pay to leverage control of a channel. Also, most direct marketing methods such as print media or direct mail pieces won’t work for content promotion. They are too expensive, and the return on investment is too limited. There are paid promotion strategies that can be very effective when it comes to marketing your content. Paid Search – Pay per click campaigns using Google AdWords are a sure fire way to increase traffic, and there are ways maximize your budget. Make sure your ad copy matches the content your promoting. Targeted Facebook Ads – Facebook allows you to promote posts in much the same way as PPC. You can also target your promoted posts to reach a desired demographic. Promoted Tweets – You can now pay to promote individual Tweets on Twitter. Like Facebook, Twitter makes it easy to target certain demographics (gender, education, location, and others), making it easier to get your content in front of the right people. Content Distribution – Sites like Outbrain and Taboola are comparatively inexpensive content promotion networks that allow you to advertise on related blogs and websites. Check out this post on Contently for CPC breakdowns and pros/cons. Retargeting – If you’re not using this strategy yet, you’re really missing out. It’s a great way to promote your content to your existing audience through Facebook and Google AdWords or the industry leader, AdRoll. Promoted Content – Two great services come to mind to promote your content, StumbleUpon and Reddit. Both are a great way to get more visibility and increase your monthly visitors, but don’t except your content to hit viral status with this method. One drawback to paid media is that it can have poor creditability if not done properly. Remember, paid content promotion is different than outbound marketing, and you will want to craft your ads accordingly. With direct marketing, you need to get to the point fast. While, with inbound marketing strategies, you can be softer and have the opportunity to test variations. Also, you typically are not selling a product as such, so your ad copy should encourage the target audience to engage with your content or comment on it. Or better yet, your paid media campaigns will hopefully get your audience to share and link to your content. 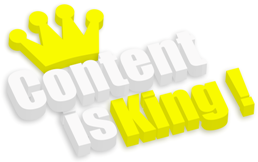 Which brings us to the highly coveted content promotion goal for us all…earned media. #3 – Earned Media is Gold! Earned media is the most valuable promotional asset available to everyone in digital marketing or as website owners. However, it’s more difficult to secure, because you don’t have as much control over it. Earned media assets are basically shares and links from authoritative sources in your industry. Effectively, your audience becomes the channel. The value of earned media promotion is two fold. You not only get the increased exposure, but you also benefit from the media outlet’s perceived authority and reputation. Social Sharing – Shares on LinkedIn, Facebook, Twitter, Tumblr, etc. This is the most basic level of earned media promotion, and results can range from nominal to impressive depending on your content and who is sharing it. Referrals and Links – Having well respected bloggers write about your content, or reference your content, is some of the best advertising you can get. That being said, it rarely happens without a bit of work on your part. You will need to reach out to the influencers in your industry, and do a bit (actually a lot) of self promotion and outreach. This will take time, but the dividends are tremendous. PR Coverage – Whether it’s a trade journal or a newspaper, getting picked up by traditional media outlets is a definite plus. Aggregator Sites – Sites like Reddit and HackerNews can drive a great deal of traffic to your site, if your content gets picked up. Even when the traffic flow from these sites is less than staggering, you still benefit from getting your content in front of bloggers and influencers in your niche industry. The drawback? There are times where you can garner negative references to your content. But, you know what they say, “bad press is good press”. I “earned” a negative reference a while back from Marketing Land where the author only read my headline and didn’t read the article. Um hello, yes, we’ll take this link! It spiked traffic to our site right away, and continues to bring readers to our blog. Earned media is truly the holy grail for your digital marketing efforts. Promotion is key to getting the most out of your valuable content and a steady flow of traffic to your site. Ideally, you want a promotional plan that includes all three media assets, and content marketing truly is the cornerstone of great SEO. Your owned and paid assets should be used to spread awareness of your content, so that it has perceived value to your potential earned assets. You can think of earned media as the carrot at the end of the promotional race. Content promotion isn’t easy, and it takes time, but when executed well, it will bring great results. That piece of content that you worked so hard to perfect will have a longer lifespan, and will continue to bring dividends down the line. What your thoughts on content promotion? Please start a discussion in the comments below, and feel free to share…of course.